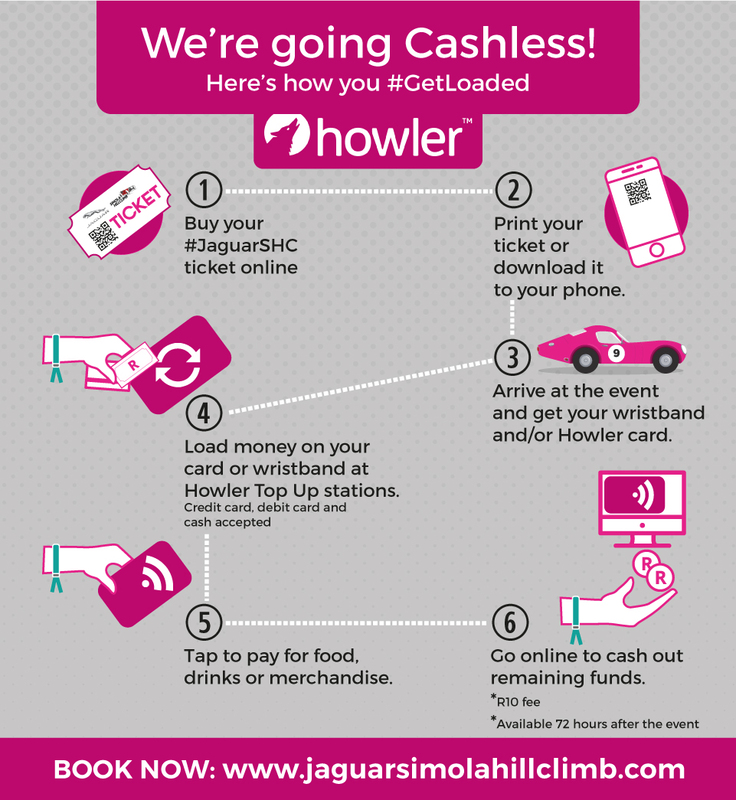 KNYSNA, South Africa, 26 April 2018 – An innovative new cashless system has been introduced for the 2018 Jaguar Simola Hillclimb, which takes place in Knysna, starting off with Classic Car Friday on 4 May, followed by King of the Hill on 5 and 6 May. With the focus on providing maximum convenience, improving safety and limiting congestion at pay points for this popular event, the cashless technology promises to make the Hillclimb an even more enjoyable and welcoming affair for spectators and competitors alike. Tickets for the Hillclimb can be purchased online via the Jaguar Simola Hillclimb website (www.jaguarsimolahillclimb.com), and these can be printed our downloaded to a phone. On arrival at the event, most visitors will receive an Access wristband with an RFID Chip. Holders of General Entry Tickets receive a wristband without the chip and will need to purchase an event-specific Howler Loaded Card (R10). All purchases at the event can then be made with these devices. Howler ‘Get Loaded’ stations have been established at easy access points in the various spectator areas, enabling visitors to load and top up money on the Howler card or Access wristband via a credit card, debit card or cash – and then it’s simply a matter of ‘tap to pay’ for any purchases with the card or wristband. Leftover funds can be cashed out online three days after the close of the event. Expert supervision will be on hand to assist visitors at all ticketing points, and at the Get Loaded stations around the venue.